TROPANG TNT sustained its resurgence in the homestretch of the PBA Commissioner’s Cup eliminations, edging Mahinrda, 83-78, to clinch a spot in the quarterfinals after their road game at the Puerto Princesa Coliseum in Palawan. The Texters turned to a stifling defense down the stretch to emerge victorious in a low-scoring, grind-out battle that saw just one point scored by both teams combined in the last three minutes and change. Import David Simon typified the Texters’ defense as he put up a stellar job on Enforcers counterpart Augustus Gilchrist after Jayson Castro, Jai Reyes, and Dylan Ababou provided the offensive buffer for the defending champions, who stretched their winning streak to four games. 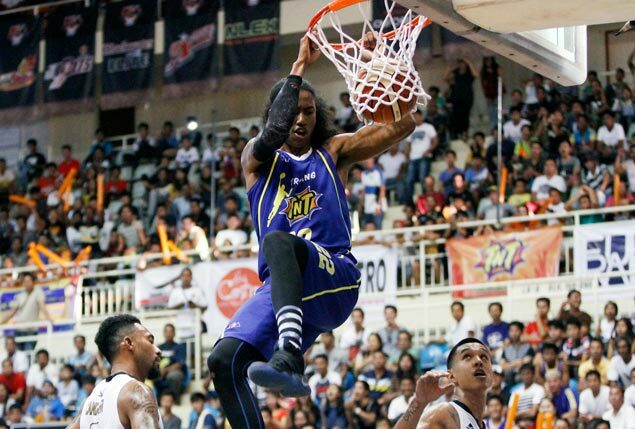 TNT, which jacked up its win-loss record to 6-4, put the Enforcers, who dropped to 4-6, on the brink of elimination. Reyes led the team with 12 points, Castro added 11 points off the bench, including four of the Texters’ last five points, while Ababou scored all his nine points – all from beyond the arc – in the payoff period. Simon chipped in just 10 points, but added 14 rebounds, three steals, and three blocks –one on Gilchrist with a under a minute left. Tropang TNT 83 - Reyes J. 12, Castro 11, R. Reyes 11, Simon 10, Ababou 9, Tautuaa 8, Rosser 7, Seigle 6, Rosario 5, Fonacier 4, Carey . Mahindra 78 - Gilchrist 21, Dehesa 12, Revilla 11, Canaleta 9, Ramos 6, Aguilar 4, Bagatsing 4, Digregorio 4, Ballesteros 2, Guinto 2, Yee 2, Pinto 1, De Vera 0, Elorde 0, Webb 0.